SSL’s immersive audio implementation for System T places support of immersive audio for ATSC 3.0, Dolby Atmos, and MPEG-H at the heart of the console architecture. The new immersive audio implementation for SSL System T.
LAS VEGAS – NAB 2018 (Booth # C3026). 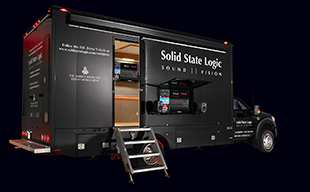 World Leading audio manufacturer Solid State Logic is proud to announce the release of v2.0 software for its System T broadcast audio production platform. System T includes a range of consoles, remote hardware & software interfaces, processor engines, and I/O, all designed from the ground up to be part of a next generation IP network-based broadcast production environment. With a collection of high profile installations around the world already operational, System T is proving the benefits of IP-based production workflow today. At NAB 2018 SSL will showcase a new System T v2.0 software release that introduces major additions, including immersive audio, 'appified' software, and DAW control. NAB will also see the global premiere of the 32-channel version of the S300 compact broadcast console. SSL’s immersive audio implementation for System T places support of immersive audio for ATSC 3.0, Dolby Atmos, and MPEG-H at the heart of the console architecture. With the emergence of 3D Immersive Audio in broadcast as well as in film, SSL’s new 3-axis co-ordinate panning for System T incorporates 2- or 4-channel overhead speakers into the available channel and bus formats. As well as positioning mono and stereo sources in a 3D sound field, System T can accept multichannel 3D sources and fine tune their spatial components as they are added to the final production mix. This is essential in multilingual sports productions where effects and ambience multichannel 3D ‘beds’ will be used extensively as the basis of the individual program mixes. System T can accept multichannel 3D sources and fine tune their spatial components as they are added to the final production mix. This is essential in multilingual sports productions where effects and ambience multichannel 3D ‘beds’ will be used extensively as the basis of the individual program mixes. SSL has also applied its extensive experience of DAW Control to the creation of the most comprehensive DAW Control available in a broadcast console. The system makes full use of System T touchscreen and hardware controls and includes a dedicated screen interface for control over the DAW mixer environment and transport controls. SSL will demonstrate v2.0 at the show with S500, S300 and Tempest Control Rack (TCR) systems and the complete Network I/O range. The acclaimed SSL Live console range will also be available for demonstration.